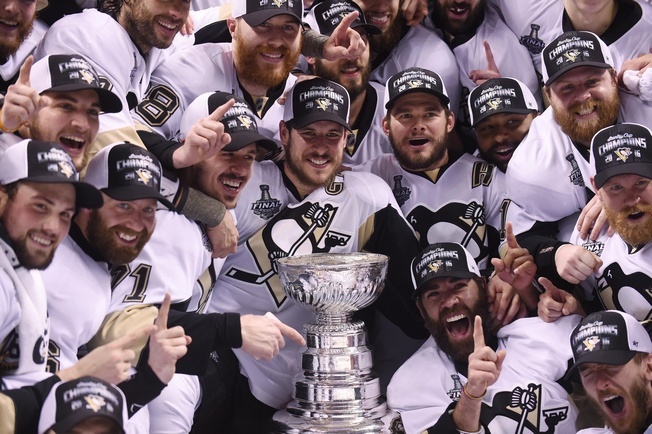 The Pittsburgh Penguins closed off the 2015-2016 by winning the Stanley Cup and they’re hoping for identical results in 2016-2017, albeit without the rather sloppy start. The Penguins didn’t look sharp in the first half of last season and finished with a 48-26-8 record that wasn’t indicative of their play when things got tough. Even Sidney Crosby struggled out of the gate and the Penguins fired head coach Mike Johnston, hiring Mike Sullivan as his replacement in December. Pittsburgh was 15-10-3 when Johnston was canned and they’d only scored 67 goals, having allowed 67 goals against. And Crosby had just six goals in 28 games, with only Evgeni Malkin scoring on a regular basis. Some, like yours truly, ascribed the Penguins’ slow start to how things ran out of gas in the previous post-season. Pittsburgh dropped a series to the New York Rangers in five games and failed to score more than one goal in each of their four losses, so the notion that the Penguins’ famous offence could dry up had to be rattling. But with the Cup win last season, all seems well. Right? Despite the slow start, Crosby eventually turned it around and put up 85 points in 80 games. 10 of his 36 goals came on the power play, while nine were game-winners. The 29-year-old averaged 20:28 of ice time per game and cracked off 248 shots on goal. He remains one of the best players in the sport, but injuries are becoming an issue. Malkin had 58 points in 57 games, including 27 goals. He averaged 19:22 of ice time a game and posted 162 shots on goal, with 11 of his goals on the power play. The Russian is a power play presence with Crosby, but he struggled in the post-season after an elbow injury and was demoted to the third line. There is talk that he may remain there to start 2016-2017, which could amount to a decrease in overall point production. Phil Kessel put up 59 points in 82 games and seemed to improve under the tutelage of Sullivan, who emphasized an attack-first mentality and let the 28-year-old run a little. The Madison native registered 274 shots on goal and came up with 22 points in 24 post-season games, completing an impressive run that saw him hoist hockey’s ultimate prize. Chris Kunitz had 40 points in 80 games, including 17 goals. He plays a fore-checking game and brings a little grit to his line. He benefitted greatly from a move away from Crosby, which could mean he’ll see more starts alongside Malkin. Winger Patric Hornqvist put together a good year, with 51 points in 82 games last season. He should be set to return from a hand injury when the puck drops on 2016-2017. After Sullivan swept in to Pittsburgh, Kris Letang took off. He was fifth in the league in points after the new coach, putting up 67 points in 71 games. He averaged 26:56 of ice time a game, tallied five power play goals and came up with 15 points on his way to another Cup. Letang may catch the injury bug from time to time, but he’s one of the most electric defenceman in the NHL and gives the Penguins a fourth forward when the attack starts to press. Brian Dumoulin moves the puck well and can play big minutes in a shutdown role. The 25-year-old had 16 points last season, all assists, and can seem a little wobbly when he has the puck on his stick. That said, he’s an ample blueliner at 6’4 and could be ready to emerge as a dominant defensive defenceman. 22-year-old Olli Maatta is impressive. He put up 19 points in 67 games and added seven points in the playoffs. He nearly topped 20 minutes a game in the regular season and plays an intelligent game in all three zones. Veteran Trevor Daley rounds out the top four. He put up 28 points last season and can move the puck out of his zone with aplomb. He also logs big minutes. The goaltending picture is far from settled in Pittsburgh. Matt Murray staked his claim on the starting gig in the post-season, where he went 15-6 and led the Penguins to the Stanley Cup. He was 9-2-1 in the regular season and took over when Marc-Andre Fleury suffered a concussion. Many see the 22-year-old from Thunder Bay as the man to beat in October. But Fleury, the franchise goalie, will have something to say about it. The 31-year-old was on his way to a career year before injury took him down. He went 35-17-6 last season, with a 2.29 goals against average and a .921 save percentage. He registered five shutouts, but saw under 80 minutes of action in the playoffs and struggled to find his game at times. The Penguins have seen a lot of prospects hit the main roster over the past few years, which means it could be time for a new group to start getting into position. Most believe that new group is fronted by Oscar Sundqvist, who saw time in 18 games last season and got some playoff experience. The 22-year-old Swedish centre plays a physical game and can agitate, but his scoring potential may be on the low side. Defenceman Stuart Percy can move the puck and knows how to eliminate mistakes in his own end, so the Penguins could take a long look at him this season. He played in three games last season and looked smooth when he kept things simple, but the 23-year-old from Oakville could stand to have a little bulk on his frame. The Penguins have all the pieces to take another run at the Stanley Cup. A lot will hinge on how well they come out of the gate, but Pittsburgh has proven a knack to overcome slow starts. And with Sullivan behind the bench and the forwards mobile once more, there’s little reason to doubt the offensive prowess of the defending champs.